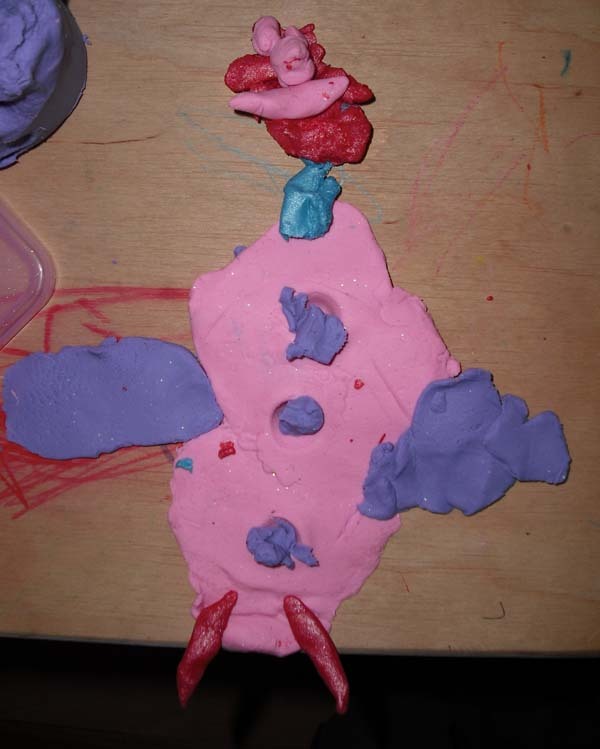 You are currently browsing the tag archive for the ‘Play-Doh’ tag. It’s just a blob of coloured squashy putty. One of those kid-things that you vaguely remember. Oh, but once motherhood strikes you realise Play-Doh is so, sooo, soooooo much more than that. It’s a pacifier, it’s a boredom-imploder, it’s a creative outlet for your budding ‘artist’, hey, it’s practically a miracle. Really. As well as its ability to keep ’em quiet for, well, at least a few minutes at a time, what makes it so wonderful is its versatility. When they’re young they’re happy to just bash it about and squash it and mash up the colours. As they get older they can spend hours making their first 3-D figurine (my two-year-old daughter was jubilant about her snowman – pictured above). And who needs plastic playfood when you can make your own carrots, peas and sausages? Bonus: clearing up is easy – unliked paints, glue & sand and the like – just stuff it back in the pot for next time. Make your own why don’t you (the basic version is just flour, water and oil*), and your kid in messy play heaven ‘baking’ cakes without help. Just add glitter for extra visual panache. Or take a small mini-tub of it on a long plane or train journey – tetchy toddler soothed. At a festival I went to last year one smart mum had brought not only tubs of play-doh, but a foldable play table and play-doh cutters/shapers/rollers as well. The result? Four ecstatic 3-5 year olds kept busy out of harm’s way for a whole blessed hour while bleary-eyed parents enjoyed a quiet coffee and chat. Here’s my advice: as soon as your baby stops jamming all and sundry into their mouth get them started on it. And from then on they will (hopefully) never stop. Well, until they start hammering the Nintendo DS anyhow. Dare I say even adults get a certain satisfaction from squashing, rolling and shaping this stuff on occasion. And here’s the key, unlike some toys we find ourselves spending outrageous amounts of money on only to find they’ve grown out of them after 6 months, this stuff isn’t only cheap, there seems to be no age limit. Which is the holy grail where cash-strapped parents are concerned.